Marco is a highly acclaimed Brazilian player and teacher who performs choro and several other Brazilian styles, as well as jazz. He has several different instruments. 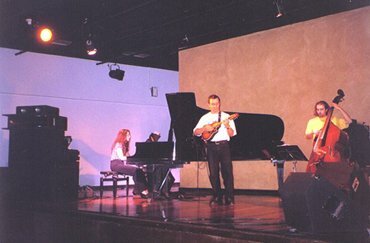 Above he's playing an Ovation acoustic/electric with pianist Fernanda Chaves Canaud and bassist Jorge Ribeiro, of the group Vibrações. Below, Marco takes a whack at a Godin A8. Check out his Web site.